113 years of hard sitting is coming to an end…. The good works of life consist of many small units. Family comes to aid of historic structure. The Kwenski Krewe: (left to right) Kendell Kwenski, Kay Kwenski, Norma Kwenski, Brent Kwenski and Montana Kwenski. The family provided the funding for handrails at the historic Crocker Memorial Church (1901) which is curated by the Historical Society of Sarasota County. The gift was made in memory of Brad Kwenski, Norman’s husband the the dad and grandfather of Kwenski family. 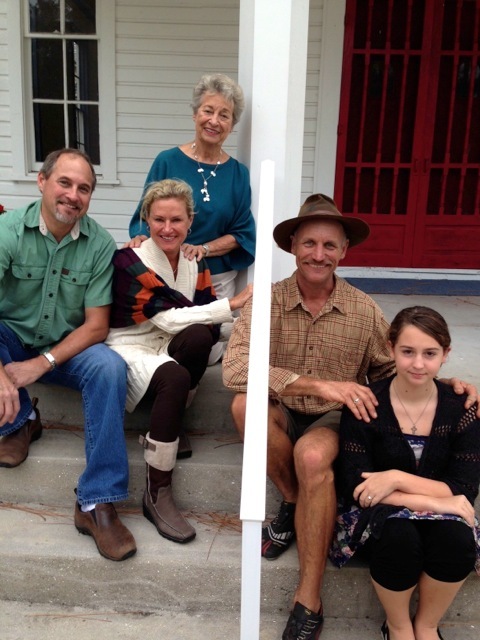 The family of Norma Kwenski, a member of the Sarasota Historical Society of Sarasota County, responded to a need at the Crocker Memorial Church (1901) by donating the funds to provide hand rails to the porch of the de-sanctified church building in Sarasota’s Pioneer Park. These new handrails provide additional safety for people come to the Crocker for monthly member programs, for weddings, and for community social and civic meetings and public events that are held at the Crocker year round on a continuing basis. Has it been a memorable year for your family? Make it an historical year! As another “season” draws to a close here in Sarasota County, it’s time, naturally enough, for Historical Society fans, members, and followers to look back. Haven’t you ALWAYS wanted to peek in their drawers? Here’s what some members of the Historical Society got to do this month: peek in John Ringling’s dresser drawers! 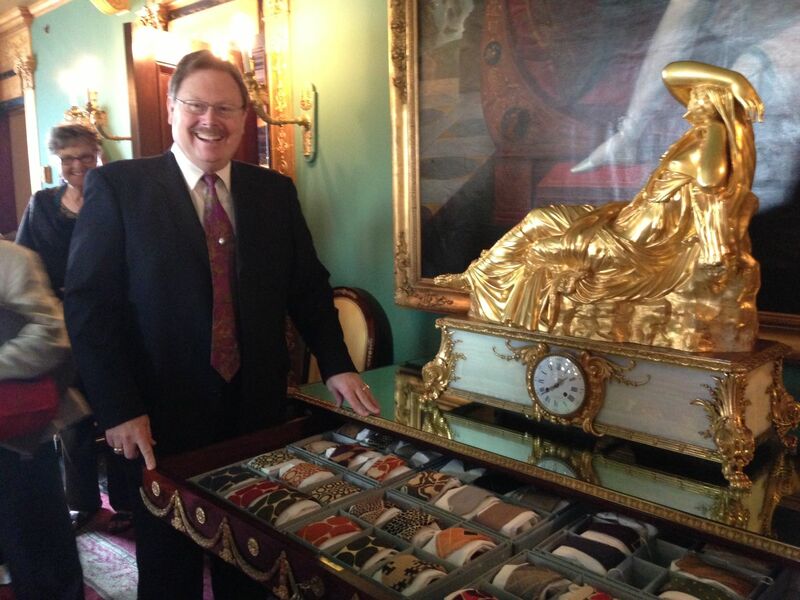 Ron McCarty, Curator of Ca’d’Zan, shows Historical Society members John Ringling’s haberdashery. Click to see John Ringling’s ties close up, something you don’t get to see on a public tour. HSoSC’s private tour sold out almost the same day it was announced to our members. Join HSoSC and get first dibs on tours like these! We are blessed to have Ron as an avid supporter of the Historical Society of Sarasota County. Join him and hundreds of your fellow citizens and seasonal residents in supporting our mission! Here’s what’s coming up in the near future! Like to learn more? Sign up for our free e-newsletter. No nagging, no spam, just a glimpse into how HSoSC helps preserve and present the history of Sarasota County. 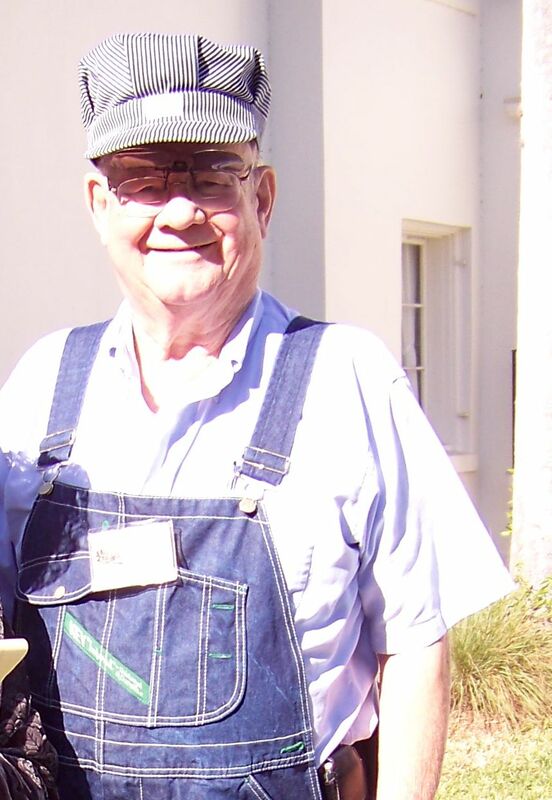 Pete in his Sarasota railroad man outfit at a HSOSC event. It is with sadness and regret that we tell you of the passing of Pete Esthus, a wonderful man and great supporter of the Historical Society. Our hearts are full, and we offer condolences to his wife Diane and their family. If you would like, as the family suggests, to make a donation to the Historical Society of Sarasota County in Pete’s memory, please send a check to our mailing address, PO Box 1632, Sarasota, FL 34230. Or use your credit card by calling our office at 941-364-9076 Monday- Friday, 10am to 2pm. We’re SO ready for our close-up! The talents of Greg Wilson are evident in the beautiful photographs he took of our two historical buildings at the Historical Society of Sarasota County. See Greg’s favorite (and our!) shots of the Bidwell-Wood House and the Crocker Memorial Church on his site. A new addition to our museum! We are so fortunate to have great donors in our area that are willing to part with their treasures knowing they have a safe place to live here at the Historical Society of Sarasota County.